figures centrally in historical as well as legendary accounts of the early Buddhist community’s transformation into a world religion. Aśoka’s landmark reign (c. 268-232 BCE) laid important structural foundations for subsequent South Asian imperial formation and corresponding trans-regional Buddhist networks, while his memory has continued to inspire and shape Buddhist practices and politics into modern times. that have survived in scattered places throughout what was once Aśoka’s Empire, spreading from central India to the Northwest Frontier province of Pakistan. were composed in the vernacular language (Prākrit) of Magadha (northeast Indian), where Aśoka lived and ruled, modified as appropriate in the various regions where they were inscribed or erected (one of them also appeared in Aramaic and Greek). Aśoka intended them to be read aloud, announcing his policies, laws, decisions, and especially his religio-political philosophy to all his subjects in a language they could understand. The central conception underlying the philosophy of these inscriptions is Dharma (Skt. ; Pāli, dhamma; Prākrit, dhaṁma) or “righteousness,” through which Aśoka claimed to rule. as is the question, given his generous support of non-Buddhist (Brahmin, Jain, and Ājīvika) as well as Buddhist practitioners, whether he was genuinely or exclusively Buddhist in personal practice. But it is certain that at least after the 8th year of his reign Aśoka strongly supported, and gained support from, the teachings and practices of the Buddha’s followers, and later legendary accounts celebrate him primarily as a paradigmatic supporter of Buddhist monks and institutions. effecting laws and policies that, as mentioned, reflected Aśoka’s piety and sincerity (or, as some scholars have argued, his shrewd self-presentation). In personal practice, he tells us, he became a Buddhist lay devotee (upāsaka) in his 8th regnal year but only began to strenuously exert himself 18 months later. - made pilgrimages to sites of significance in the Buddha’s life. - and similar “righteous virtues” (Prākrit, dhamma guṇa), which left an indelible mark on South Asian religions even outside the Buddhist context. did come true in this and several additional ways, and Aśoka’s life and deeds remained foundational for subsequent South Asian and Buddhist political and religious history. First, Aśoka’s own imperial strategies were appropriated and developed by his post-Mauryan successors, effectively constituting Aśoka’s Empire as the one that all subsequent kings struggled to remake for themselves. 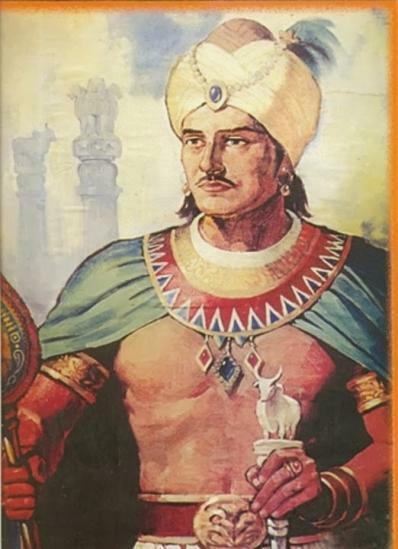 and his grandfather, dynastic founder Chandragupta Maurya (c. 322-298 BCE), whose court was visited by ambassadors of Alexander the Great (providing a synchronism with Western chronology upon which much of ancient Indian history is still dated). and he pushed its borders northwest into what is now eastern Afghanistan. He maintained diplomatic relations even farther afield, sending embassies to rulers in the far South and Śrī Lanka, and also throughout the eastern Hellenistic world, which established Aśoka among the most powerful monarchs of his day. More important than military conquest in this expansion - especially after his 8th year - were Aśoka’s innovative strategies for displaying and maintaining his imperial over-lordship, always in the context of his proclamation of the Dharma. - demonstrates enormous internal organization and vision - and was unprecedented in Indian history (it has been argued that Aśoka imitated Persian and Hellenistic predecessors). But the practice allowed Aśoka to physically and permanently mark his authority over the different regions whose submission he won, to address the subjects of these regions directly (and lovingly), and to make them feel sheltered by his single royal umbrella. This practice of inscribing decisions, donations, and eulogies in stone, and simultaneously landmarking key sites in important monarchs’ territories, became an essential mark of subsequent South Asian political formation, especially at the imperial level. for more than 5 centuries after Aśoka this lithic discourse even continued to use essentially his same alphabet and language. - continued to be developed and improved by influential Buddhist monks, nuns, and wealthy laypeople, including a string of Aśoka’s imperial successors, for more than 500 years after his death. These sites were subsequently transformed into Hindu sites or reclaimed by Buddhists beginning in the late 19th century; these remain important places of worship even today. - especially through the employment of a universal language. talking about Aśoka - and claiming to be his legitimate successor - became an important post-Aśokan imperial strategy in its own right. Aśoka’s founder status in the imperial struggles that concerned later kings made claims about his life and legacy politically and religiously significant, quite apart from their correspondence or lack of correspondence to the historical Aśoka. a second important means by which he continued to impact political and religious thinking long after his inscriptions had become illegible antiques. 1) One was preserved in the northern Buddhist traditions of Kashmir, Central Asia, and later East Asia and is epitomized by the Aśokāvadāna of the Divyāvadāna collection, composed in Buddhist Sanskrit in about the 1st century CE, then translated into Chinese and Tibetan. 2) The other was preserved in the Śrī Lankan and Southeast Asian Vaṁsa or chronicle traditions, which originated in central India, were codified in Pāli in Śrī Lanka, and were also transmitted through vernacular literatures in the region. - indicate that this pan-Buddhist discourse about Aśoka was much wider and more varied still. - many of them far beyond Aśoka’s own reach. In Śrī Lanka, Nepal, and Southeast Asia such associations have persisted into modern times. Despite the wide variation among them, all the extant versions of the Aśoka legend share a basic narrative structure, which in places bears partial affinity to the historical Aśoka known through the inscriptions. These legends all maintain that Aśoka was originally a cruel king who experienced a transformation into Dharmāśoka (“Righteous Aśoka”) after being pleased (Skt., prasāda; Pāli, pasāda) by the Buddha’s Dharma. the southern Buddhist versions highlight constant Bodhi tree worship). - a close kinsman of Aśoka’s played some special role in this paradigmatic sequence of events. - the nature of the role this kinsman played in the king’s transformation. The scholars who first deciphered the Aśokan inscriptions in the 1830s already knew these legends, and relied upon them for vocabulary and syntax, as well as for numerous “facts” left out of the inscriptions. But given the disagreements among the different versions, this required scholars to privilege one over the others, generating a number of influential theories about which version was in fact the earliest or most authentic, and attacks on the others as derivative or fabricated. - led many scholars following Smith to dismiss all of them as having any relevance to the historical study of Aśoka. Other scholars continued to treat them, at best, as colourful footnotes to the hard evidence of the inscriptions. While divorcing the legends from the inscriptions was no doubt crucial for the reconstruction of Aśokan history proper, in the later 20th century scholars returned to them with more fruitful questions than what facts about Aśoka they can provide. the information the pilgrims gathered was all based on the legends, even when it was presented to them as a reading of some inscription. now- dominant Hindus and Muslims were providing alternative legendary accounts of the pillars (and had reduced Aśoka to a mere name in their lists of Mauryan kings). Thus for most of history the Aśoka known and admired by Buddhists has been the Aśoka of the legends, not the inscriptions. privileging the authority of an Empire-building Buddhist king and the monks most closely associated with him to command Aśoka’s imperial space. The questions engendered by this discourse were simultaneously questions about the then-present, an actual interregnal Buddhist world that all Buddhists agreed to frame according to the Aśokan legacy. - were simultaneously arguments that this (not that) is the true centre of the Buddhist world, the true lineage from the Buddha, correct practice, correct doctrine. had different ambitions as regards the “this,” the particular hierarchical constellation of Buddhist polities and schools to which any particular version of the Aśoka legend committed them. they could be championed in a politically significant way only to the extent that they were believed to paint the truest picture of an Aśoka who was admired and revered as paradigmatic across the Buddhist world. Stūpa construction; Bodhi worship; gift-giving; the convening of festivals, conferences, and recitations of the Dharma; and integrity and personal piety. - in fact, that scholars have theorized a specifically Aśokan model of kingship, social order, and imperial formation that has even been invoked by contemporary politicians in these regions to a variety of political and personal ends. Individual monks associated in these legends with Aśoka and the Aśokan dissemination of the Dharma have been worshiped throughout the Buddhist world. - remains one of the most important annual Sinhala Buddhist festivals. There is pre-modern Burmese evidence of veneration of Sona and Uttara, who according to the southern recension brought the religion to that land, and likewise of Madhyantika in Kashmir. A wide variety of religious practices surrounding Upagupta, Aśoka’s favourite patriarch according to the northern recension of the Aśoka legend, were once widespread in the northern Buddhist world and survive in contemporary Burma and northern Thailand. Stories about Aśoka’s conduct as king, and that of his queens, have been invoked as both positive and negative paradigms for then-present royal conduct; as an exemplar of religious giving (dāna) more generally, Aśoka is virtually unexcelled in Buddhist hagiography. Stories about Aśoka’s past-life deeds and their consequences in the present have also enjoyed this more general religious significance in Buddhist countries. for he emerged there as a model of virtues worth imitating universally, even outside the cultural and religious context to which both the historical and the legendary Aśokas belonged. globalism, religious tolerance and interfaith dialogue, diplomacy over violence, support for the poor, commitment to truth and liberty, personal integrity, and environmentalism. and Jawaharlal Nehru, for whom Aśoka exemplified the sort of secular federalism that India adopted at independence (an Aśokan pillar capital with 4 lions constitutes India’s official seal). Aśoka is ubiquitous in academic and popular accounts of Indian and Buddhist history ranging from scholarly monographs to comic books.